A few weeks back whilst having a bit of a tidy up through my makeup collection I was noticing a very similar theme in the sense that when it comes higher end products, I tend to love them when I first get them and over time they get used less and less. So I thought i'd share a few products from my high end stash that I am pushing myself to start using them, and remembering why I loved using them. Anyone who knows me knows that I am a budget girl through and through with almost everything that I do in life, and that also comes with any makeup or beauty purchases as I rarely ever splash out on high end products so when I do I often feel like I try to cherish them and 'save them for best', you know that saying your mum would say about your newest pair of shoes when you were younger? Well that's exactly how I am with high end makeup/beauty, so i'm making it my mission to start using these products again and really enjoy them for what they are. 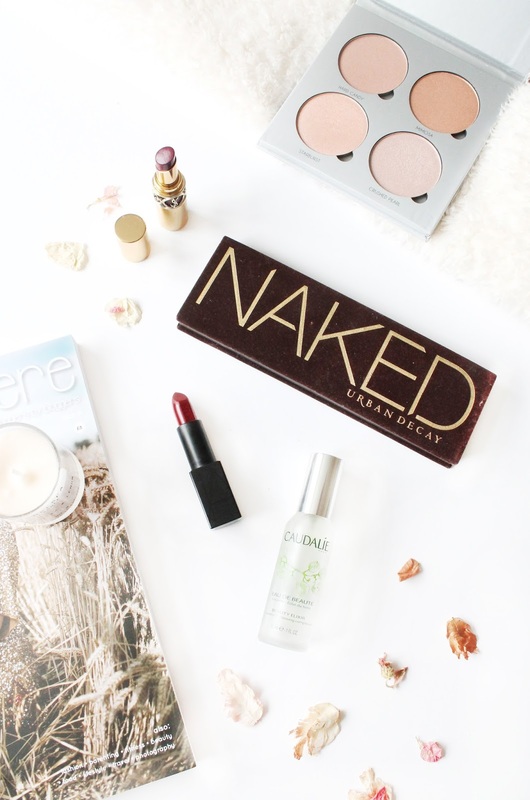 For any blogger out there, i'm sure like myself you own at least one of the Urban Decay Naked Palettes and owning three of them myself I find that I only really use the Naked 3 Palette (£39.50) as I just gravitate more to the shades and they suit me the most out of the three that I own. Having said that when I got the first Naked Palette (£39.50) I absolutely loved it and used it so much, as the shades are absolutely stunning and work so well together. As we move into autumn winter I can definitely see myself wanting to darken my eye looks a little more and play around with more bronzy tones, of which this palette is perfect for as it has some lovely autumnal shades that will really make my eyes pop. Back when I started blogging my choice in lip colours was very different to what it is now and I used to love a pink lip in the summer and more berry tones in the winter, so it's safe to say I have a fair few lipsticks that I don't wear anymore. Having said that I do still love a darker lip in the winter and two lipsticks that I completely forgot I owned are the YSL Rouge Volupte Shine Lipstick (£26) which is a beautiful berry shade that gives me all the autumnal vibes when I wear it, but granted I do only ever wear it on special occasions just because of how stunning it is. The other is the NARS Audacious Lipstick (£25) in the shade 'Charlotte' which is a beautiful deep berry red that is so perfect for those crisp days and is one I typically save for Christmas time, but it's definitely one I want to start wearing more! In the past year i've probably doubled my highlighter collection, and with each highlighter I buy often means it's one less that i'm using purely because i'm enjoying using said new highlighter. Whilst sorting through my palettes I realised that i've not used my ABH Glow Kit (£39) in quite some time and I have no reason for not using it other than I own way too many highlighters. Sadly this glow kit has been discontinued, but it contains four beautiful highlight shades that are absolutely stunning for us pale skin gals and is definitely one i'm going to be reaching for more as we head into the colder months. Lastly is a skincare product that I only recently pulled out because I was suffering with quite sensitive skin and I always found the Caudalie Beauty Elixir (£12) to really help soothe my skin whilst also giving it a quick refresh throughout the day. For the past week or so i've been giving my skin a good spritz with this morning and evening, and already i've noticed a difference in my skins appearance and it also feels incredibly soothing whenever I use it. What high end products do you love using?